"These are easy to make and should be stored in the refrigerator, or the freezer. My kids look forward to these in lunches and after school." In a medium bowl, stir together the cake mix and instant pudding. Add eggs, oil and water, mix until smooth. Pour into the prepared pan. Bake for 30 to 35 minutes in the preheated oven, set aside to cool. Prepare filling using the second set of ingredients. In a small saucepan, stir together the flour and milk, and cook over medium heat until boiling. Stir over heat until thick, about 2 minutes. Remove from heat and set aside to cool. 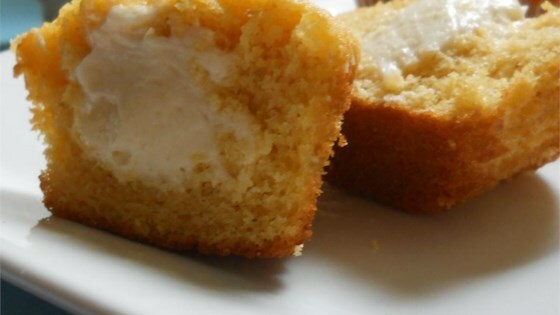 In a medium bowl, cream butter, shortening, sugar and vanilla until light and fluffy. Gradually beat in the flour mixture at high speed. Invert cooled cake onto a tray. Split into two layers horizontally, and fill with the frosting. Replace top layer and cut into 3x2 inch rectangles. These keep better if individually wrapped. I made cupcakes and filled them with the cream filling. Then I made a buttercream icing flavored with banana extract. It was great!! These are scrumptious, yummy and delicious. They remind me of the Banana Suzy-Q's we used to buy back home. Everyone LOVES these! These were so yummy. I couldn't stop eating them. The filling is excellent. I used chocolate cake instead. YUMMY!!!! I WILL be making these again! I wonder if this would work as a sponge cake roll? I will try it and let you all know! Yum! Our friends loved these as did my husband!